It’s coming up on August 25th and entry includes champagne, lucky door prizes (including our very own Bridal Eve Kit) yummy things to eat. 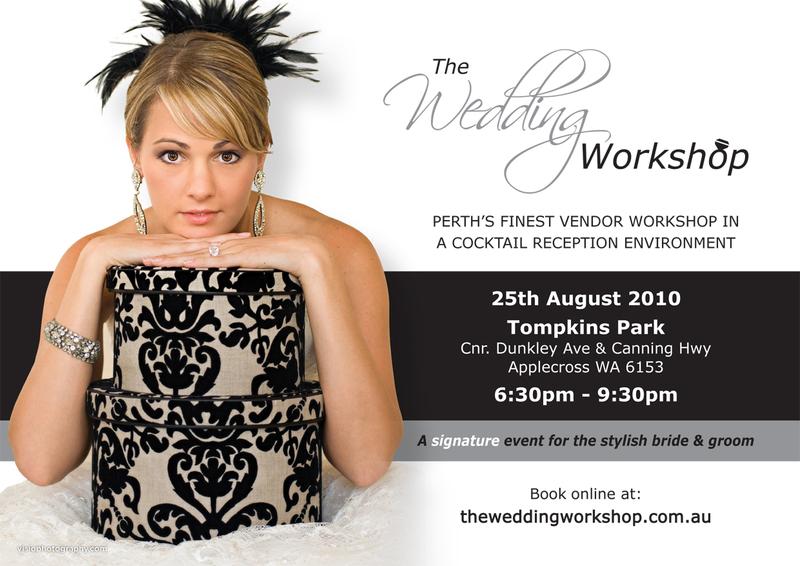 guest speakers and decadent styling- all done by one of Perth’s finest wedding planners! Visit the website to book your ticket. Pallas Couture contacted us last week about their sample sale coming up. 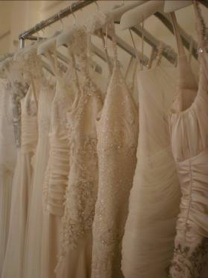 “After almost 10 years in the bridal business, Pallas Couture is delighted to host the brands very first sample sale. This unique opportunity will feature more than 100 samples ranging in price from $100 – $1,500. The sale will include gowns from past seasons samples to styles that have evolved over multiple samples or have even just been too costly to put into production, this really is a once-in-a-lifetime chance to purchase exquisite luxury at affordable prices. Being held downstairs in their Paddington studio, Pallas’ co-design directors, Joy Morris and Cathy Thomas, will be available to offer advice, tips and opinions to prospective brides. “It is a wonderful opportunity to purchase a timeless and classic Pallas design. We’ve accumulated many gowns and have decided to open this exciting prospect for Australian brides,” says Joy Morris about the sale. All gowns are sized between 8 and 12 (Australian sizing), which will suit a wide range of women. There are also a number of paper silk gowns which could be dyed for red carpet, school balls and other formal events. The sale will run for four days only from July 29th – August 1st, 2010 and appointments must be made. No walk-ins will be accepted. All gown flaws (if any) will be clearly marked and no alterations will be made. Cash, Mastercard, Visa and EFTPOS will be accepted however there will be a 1% charge on all credit purchase with no returns. There will also be a cancellation fee for missed appointments. 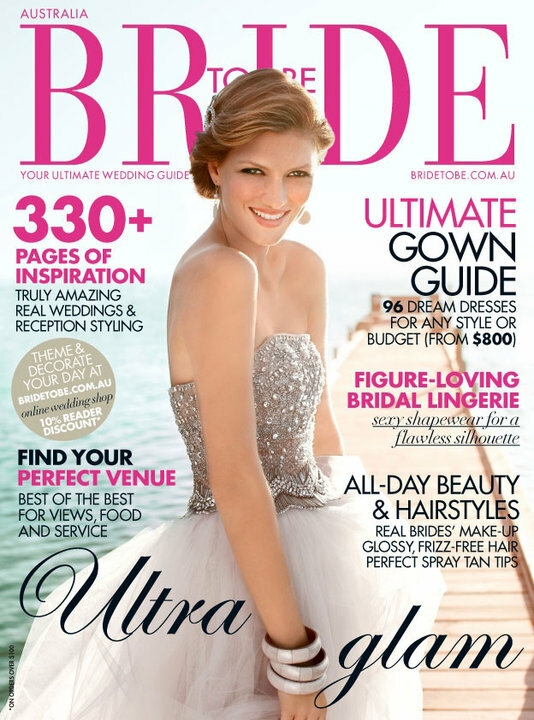 We’re so thrilled to have our Jetsetter Honeymoon Kit included in the latest edition of Bride To Be magazine! Many moons ago, we dreamed up this kit to help jet-setting honeymooners survive their adventures! The kit is packed full of almost every essential you might need when hopping on a big bird to an exotic destination. In honour of our feature, we thought we’d explore a little behind the kit contents! First up are two functional laundry bags from Australian company The Laundry Bag. The bags are lightweight, durable and can hold all your delicates until you get to a washing machine Each bag (we’ve included two, one of each design) is fully lined and features a leather carry strap, extra pockets and a wet bag. Next up are our leather travel accessories! We’ve included a leather passport holder for the bride and the groom, a leather documents holder for all your tickets and travel documents and four leather suitcase tags to identify your newlywed luggage as it rolls off the carousel. For international jet-setters we have you covered- we included a set of three travel adapters and a double set of travel locks Keeping you safe, secured and able to use your hair dryer! For a little bit of travel pampering, we turned to our friends at Absolutely Gorgeous and included their handmade Seduce Me bath milk sachet and body oil, for a little post wedding bliss! We love beautiful stationery and a trip such as your honeymoon deserves only the best! We’ve included beautiful travel journals from Zetta Florence- complete with a vintage style map of the world on the cover! We haven’t forgotten the basic essentials you’ve come to know us for! There’s toothbrushes, band-aids, sunscreen, bacterial hand santiser and even indigetion tablets! Just call us “essential travel insurance”. 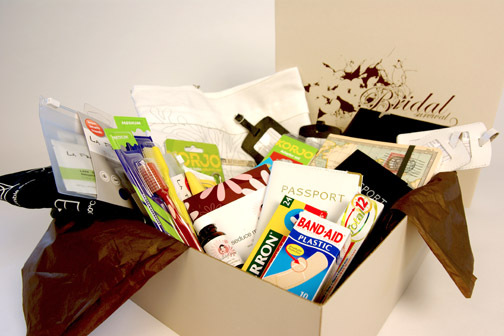 The Jetsetter Honeymoon Kit is available for purchase in our online store now. Featured in Shop TIl You Drop! 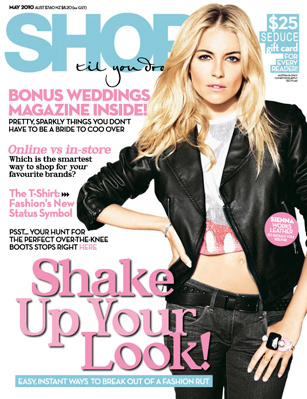 A small ‘wow’ last week when we saw we had been mentioned in the latest issue of Shop Til You Drop magazine. It is always a thrill to be mentioned in a magazine whether it is here or overseas. We are just a little bemused by the heading – ‘6 of the best – Parsimonious Bridal Blogs’. Thanks Shop girls! Bridal Survival is thrilled to be a part of brand new wedding website Portobello Bride! The brand new site launched last night and we love the clean, elegant feel to it! We can’t wait to see what Kim has in store with the boutique markets and we’re so looking forward to being a part of it all!